If you have the new user management features (i.e. you have the Site administration page), you will soon see a new billing page within OnDemand that shows an up-to-date view of your current subscription. Once you have been upgraded to the new user management features, make sure that you review the members in the 'site-admins' group as they will be able to view your billing information. We will also progressively roll out the new OnDemand purchase experience in June and you will be able to perform most of the purchase and evaluation tasks within your OnDemand site instead of on the My Atlassian site. For details about the new experience and what it will look like, head over to OnDemand Purchase Experience FAQ - May 2014. Not sure what the new user management features are? See User Management FAQ - May 2014. Recently we added a new date lozenge to Confluence. To insert a date lozenge type // to trigger the date picker or type a date in the format dd/mm/yyyy or dd-mm-yyyy and press enter. For example 23/05/2014 will appear as 23 May 2014 . The Task Report macro now has a sort parameter that can be used to sort tasks by due date, assignee or page title. The way tables are rendered in PDF has been improved. Column width is now based on the amount of content in the cell, rather than all columns being equal width. When you create a new blank space the sidebar will now display the page tree by default. To change the navigation back to child pages go to Space Tools > Configure Sidebar. Notifications will no longer be sent when you move a page. Featured topics appear more prominently on the Topics and Ask a question pages. To feature a topic go to Questions > Topics then edit the topic and select Featured. 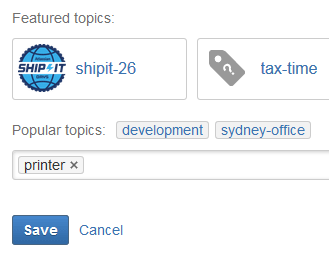 Confluence Administrators can now delete topics that have no questions from the topics tab. If your Questions instance is public-facing you can improve search engine optimization by customizing the title and description that appears in search results for the Questions dashboard. Go to > General Configuration > Questions Customization.